June 25, 2013 by C.S. Clarke, Ph.D. In my prior article, I commented on Paul Krugman’s “The Jobless Trap.” (http://www.nytimes.com/2013/04/22/opinion/krugman-the-jobless-trap.html?_r=0) His article covered why résumés showing unemployment for six months or more generally get tossed in the trash. My article covered how to address the “employment gaps” with a résumé that honestly shows employment during times you’ve been without a j-o-b. In my article today, I’m considering an additional problem with résumés that show another element that additionally causes HR or the hiring manager to trash them: your age. One of the worst parts of today’s joblessness is the ageism problem. 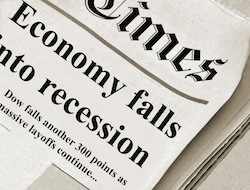 Entire sections of the economy collapsed as a result of the banking/Wall Street/mortgage/insurance crisis. Many companies went out of business or were bought out and stripped of assets. Many jobs are never coming back. And a great number of those jobs were held by employees over 40 years of age. Indeed, many employees who were ousted were over 50 years of age. It is difficult for people 40+ to get jobs and extremely difficult — often impossible — for those over 50. One of the reasons it’s so difficult is that people over 40 are in their higher earning years. They’ve usually amassed the skills and experience for their jobs that makes them more valuable. They’ve usually had numerous promotions and have risen in rank to positions that, in better economic times, give them a kind of “tenure.” They may have some political pull. And, if they want to change employers, as long as they are already employed and are looking to move up, they are still considered assets. However, in hard economic times, such employees are often the first purged because the employer, or the organization that has bought out the old employer, saves money by “making do” with cheaper, younger, less experienced employees. The older, more experienced employees that do keep their jobs also may loose rank and be required to take on the work that used to be done by two or more employees. Under those conditions, they may lose their positions because they simply can’t keep up with the impossible demands. So, now we have millions of unemployed who may never work again, simply because of an economic downturn. They didn’t do anything wrong. They weren’t fired. It’s not their fault. Now, there are gaps in their résumés (or work histories, for those who don’t use résumés) that make it almost impossible to get jobs again. Yet, those millions still have families to support and bills to pay. They’re too young to retire. Even if they had retirement benefits available. They still need to contribute value to society. They still want to work. They still want to be of value. And they’re giving up. About a week after Krugman’s article, Mike Stobbe, a medical journalist who covers the CDC for Associated Press, wrote about the sharp increase in middle-age suicide and its connection to the ups and downs of the economy. You can read it at http://bigstory.ap.org/article/us-suicide-rate-rose-sharply-among-middle-aged. So, this is a time when a growing number of adult children are living — often with their spouses and children — in their parents’ homes. Because they can’t get decent enough jobs to support themselves or families. And at the other end of the scale, parents and grandparents are killing themselves because they, too, can no longer support themselves or families. Now, consider that only about three days after the Stobbe article on suicides came out, the Department of Labor announced that the economy added 165,000 jobs, when only 88,000 were predicted. And the previous month’s figures were revised to show a higher number than originally estimated. The jobless rate fell to 7.5%. What happened as a result? The stock market soared higher on the false optimism that created. Yet, if you actually do the math, you’ll notice that pay for workers is not even keeping even with inflation, so most folks’ salaries are worth less. Not to mention that 165,000 jobs are a pittance if you consider that 12 million people are actively looking for work and millions more have simply given it up as an impossible task. Read the article Paul Davidson and John Waggoner wrote at USA Today, to get more insight on this: http://www.usatoday.com/story/money/business/2013/05/05/wages-job-growth/2134207/. I could write until my fingers fall off about what we can do as individuals to spiff up our résumés to account for employment gaps and create better possibilities for getting jobs. I could write about how some older workers turn around their unemployment and overcome obstacles. It might help some individuals. But national economic policy is way beyond what even the highest-performing individuals can do. And it determines how much of an impact each individual can make in the job market. Our national economic policies are killing us. Killing some of our proven productive workers. And killing our economy. If we ran our businesses the way we’re allowing the politicians to run our economy, we’d get exactly the same poor performance and lackluster growth. And we’d lose the business. Here are some things you can do. The first two are the same as two in my last article, but as applied to the employees over 50 years of age. 1. Employ Yourself: Your best bet in the short term may be to go into business for yourself or join a friend or relative in a business venture. Not merely to have something on your résumé to explain the employment gap, but to actually learn a living. There are thousands and thousands of books, courses, videos, etc. that can help you get started, but the book series published by Entrepreneur Magazine are reliable and the publisher has been putting out the series since about the early 1980’s through it’s Entrepreneur Press publishing business. Furthermore, you can get lots of free information and advice, as well as the magazine and its books at the website: http://www.entrepreneur.com/. Remember that these days the agencies that provide temps and contract workers often offer benefits like health insurance and retirement plans. In addition, working through agencies rather than being a permanent employee can be more stable than regular employment. Old, well-know agencies are lasting longer than large employers. Think of all the unemployment that’s occurring as a result of buy-outs, mergers and other forms of acquisition. Not only can you avoid some of the age problem in getting hired, you can avoid losing your job as a result of your employer disappearing after you do get hired. 3. Become An Agent of Social Change: Regardless of what you do in the short term, in the long term, you need to get socially and politically active. Ageism is not going away. You have to fight it. You have to help change our society’s ignorance about and indifference to the plight of the middle aged and elders. To fight it you need large groups with political whack. At the very least, if you’re not already a member, join AARP. Read their publications. Get involved at a local level — see if there are meetings or groups you can attend. Study and learn more about what’s being done nationally and locally to fight ageism in employment. The more you know, the better you’ll be able to figure out how to fight.